The continuing suspicion of Gandalf as a spy of Saruman is both logical and hilarious. The facts as known to the people of Rohan are that Gandalf and Saruman are of similar ilk and before now have always stood as allies. With the trouble seeping out from the White Tower, even mild paranoia suggests that Gandalf's presence is a ploy. Add in an agent such as Wormtongue bending the King's ear, and well none of this stands as shocking. What does shock me is the fact that someone openly going by the moniker Wormtongue wormed his way into the King's confidence. There is nothing subtle about either his name or his nature. 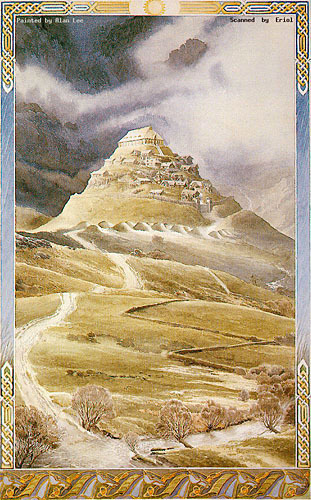 In Middle Earth people tend to bear names that with significance, be it inherited or earned. The name Wormtongue catches Gandalf's attention immediately, but my guess is that this is not due to familiarity with the individual, but with the weight of the name. They definitely aim for shock and awe when making an entrance to the heart of Rohan. Yes, the traditional giving of names tends towards acknowledgement of lineage, but in context it feels as if there is a stress on their prestige, especially in conjunction with the speaking of the value of their weapons. I've spoken repeatedly about Gandalf as a Trickster, but his whole shtick with his staff makes me laugh every time. Theoden first appears to us as an old man, worn down, suspicious, and afraid. It is heartening to see that the people of Rohan herald his restoration with joy, but the cynic in me doubts that Grima was the only bad seed. On the other hand, Tolkien tends to write his characters with strong alignments and nobility. Through stages, Gandalf brings Theoden back to himself, first by silencing Wormtongue, then through exposure and consultation, ending with an reintroduction Eomer who lays his sword at Theoden's feet. In my mind, Hama is the unsung hero of this. He let Gandalf bend the rules and then fetched Eomer from his imprisonment. Even when the tables are turned, Grima tries to talk his way out of it, and honestly makes a good show. He does have a gift with words and a turn of phrase, but his allegiance to Saruman is declared by Gandalf and Eomer confirms Grima's desired prize of Eowyn, which takes away any creedence given to Grima's words. They not only let Wormtongue go free, but they offer him a chance at redemption, similar to the mercy shown to Gollum again and again in this story. For their services the party is gifted from the armory, though they needed little in way of armaments, and they make preparation to ride out in defense of Rohan. The placing of Eowyn as steward in absence of both Theoden and Eomer strikes me as a particularly striking decision. The Lord of the Rings (and The Hobbit) both have been noted for their distinct lack of women, hence why it's so easy for me to describe the different groups by phrases such as "the men of ____." But it is worth also noting that what women he did include are by and large quite notable in their strength. Galadriel may be the single most powerful elf in Middle Earth, though I do not know how she matches against those who have crossed to Valinor, Elwyn's story may be largely secondary in this trilogy but she still plays a significant role in Middle Earth, and Eowyn has her biggest moment yet to come. There are some big diversions in the film from the text, starting off with a significantly earlier display of Grima's powers over the King of Rohan and an all-around effort to make him appear generally aesthetically unpalatable. He not only pulls Theoden's strings, but goes full creeper mode on Eowyn (which generally makes me go "ugh," but not nearly as bad as if he'd attempted sexual assault which is the all-to-common way of showing someone to be a lusting villain). There's also the addition of the death of Theoden's son (Eomer I believe is his sister's son), used as a prop to show how bespelled the King is when he fails to recognize the weight of the news. I think Grima Wormtongue was done well, but part of me wishes they hadn't strove to make the character physically unattractive - all the book states is he has pale skin, and as Frodo says on meeting Aragorn, agents of the enemy are more likely to "seem fairer and feel fouler." What they did was effective, but wasn't a challenge. The transformation of Theoden is very dramatic, and done to good effect. However, if Saruman is controlling Theoden as a puppet... what purpose does Wormtongue serve? Though I guess he does stand in as a puppet master for when Saruman has other things to do. The real notable difference regards the actions of Theoden in the face of looming war. This Theoden does not appoint his niece steward and ride off to battle with his armies to defend his land (ultimately leading to a conflict at Helms Deep), but instead evacuates the city population for fortified stand against their enemies. I forgot about this difference, and had to re-read the relevant sections of the book to make sure I read correctly. The comic relief of Gimli with the too-large chain mail is no more than that - Tolkien explicitly writes that Gimli had no need of chain mail, having his own, and his time in the armory took place before they rode out. I find Jackson's interpretations of Tolkien's women problematic. I greatly enjoy that he expands their rolls, but the downfall for Elwyn, Eowyn, and Jackson's own creation Tauriel, is his focus on the romance. Until significantly later, Eowyn's roll in the film is that of a fiesty but love-struck girl. Her unrequited feelings for Aragorn do play a roll in the story, but that's not the full story of who Eowyn is and what she achieves. I think Jackson missed a golden opportunity.